Valentine’s Day is fast approaching and for the ladies that usually means 1 thing= chocolate. Whether you’re single, or celebrating a relationship chocolate is bound to be all over the place, including cocktails. Unfortunately most crème de cacao, or chocolate liqueurs, are cheap and sugary unless you’re willing to dole out a pretty penny. The solution? 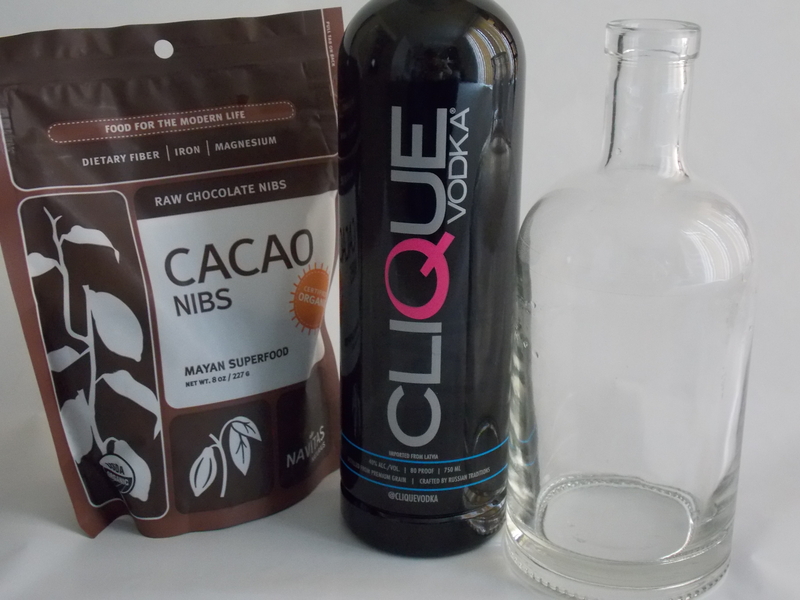 Make your own crème de cacao at home, giving you control over the sweetness and texture. Start by getting your hands on some 100% cocoa nibs, which are basically toasted pieces of pure cacao beans. You can find them in health food stores and supermarkets with a large selection, most of them are organic too! 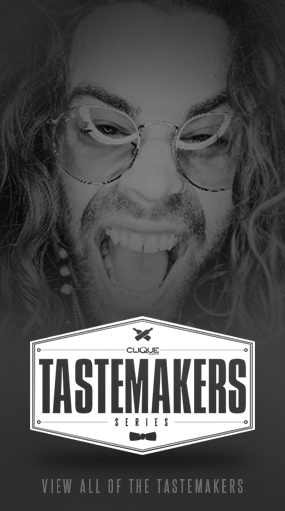 If you taste one they are very bitter and have tons of concentrated chocolate flavor, coax it out by adding 1 cup of cocoa nibs to 2 cups of Clique Vodka in a clean glass bottle. Shake it well, and 2x per day for about 4 days. If you want to speed up the process, just place it in a nice warm spot (like in front of a heating vent), and you can get the infusion time down to about 2 days. 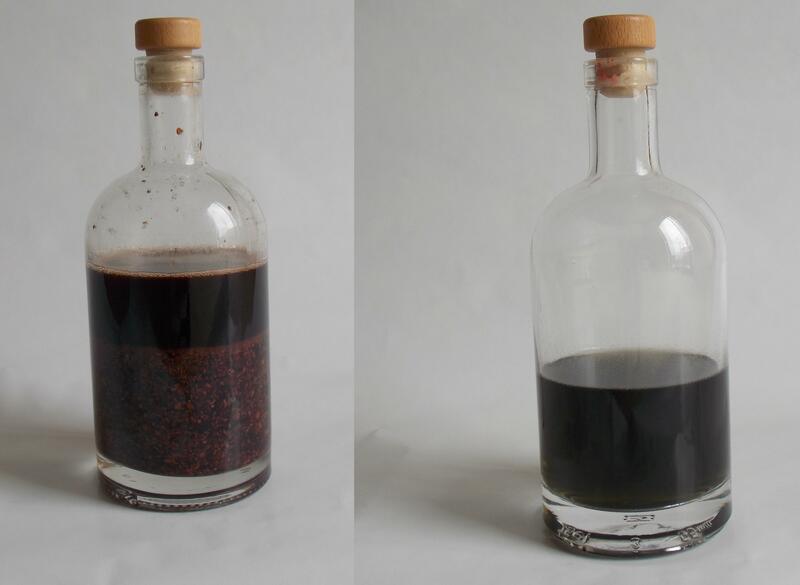 After the Clique Vodka has turned a dark brown and the nibs have lost most of their color, you can give it a little taste and see if it’s strong enough for you. If it is, strain the nibs out using cheesecloth and a fine mesh strainer, rinse the bottle and put it back in. Wha-La! 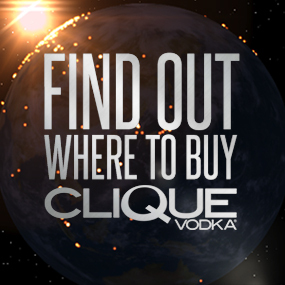 What you have here is raw chocolate infused Clique Vodka, although it will definitely need some sugar if you want it to taste anything like the chocolate bar flavor we’re going for. Since red velvet cake is basically dark chocolate with some red food coloring, add about 6-8 drops of red food coloring to your bottle of crème de cacao and shake well. 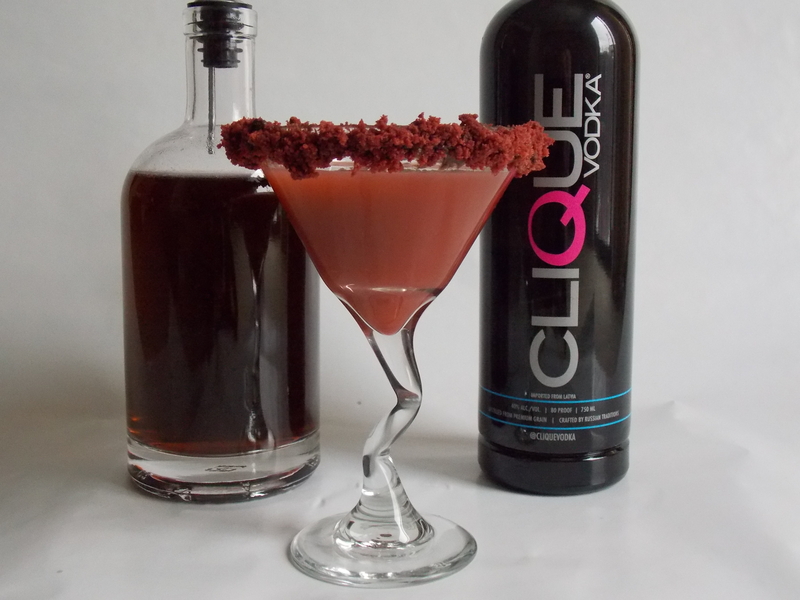 Add 1 1/2 oz of your red crème de cacao, 1 1/2 oz of Clique Vodka, and 1/4 oz cream to a cocktail tin filled with ice. 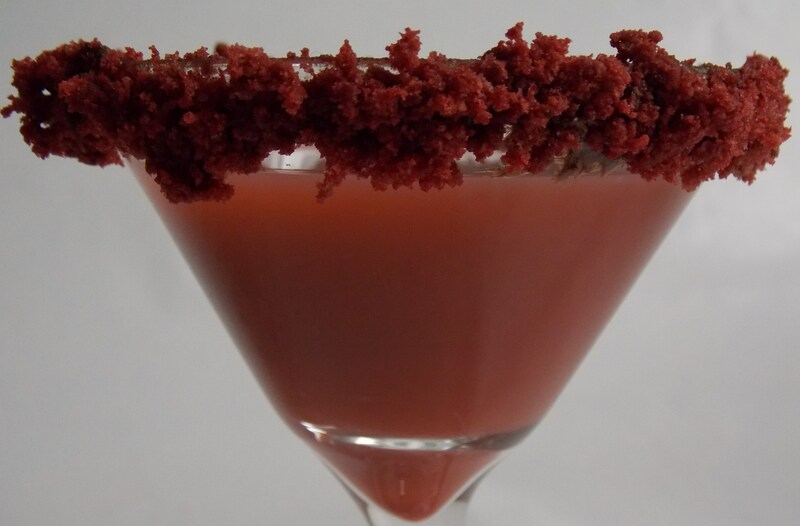 Shake very well and strain into a cocktail glass rimmed with chocolate fudge icing and red velvet cake crumbs (See below for 1 Minute Red Velvet Mini Cake recipe). 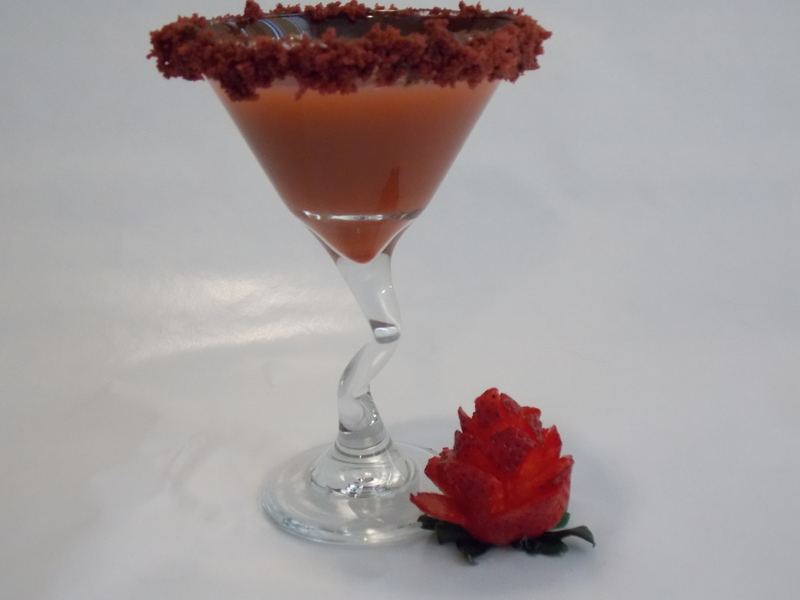 Make sure you come back next week for how to make rose garnishes!! Add 1 box of angel food cake mix to 1 box of red velvet cake and mix thoroughly. Add 3 tablespoons of cake mix and 2 tablespoons of water and stir well in a microwave safe container and zap it for 1 minute, then let cool.